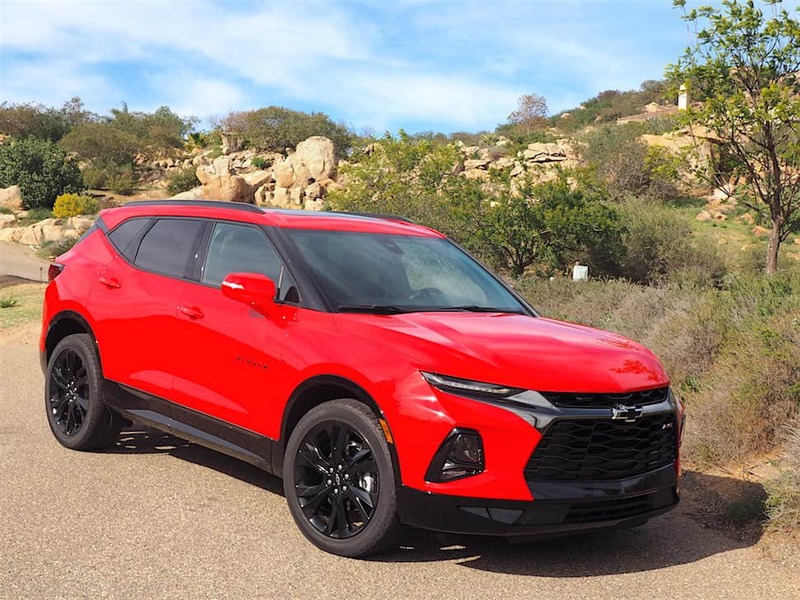 San Diego, CA – When last we saw the Chevy Blazer, it was 2005. Mariah Carey was topping the charts. George W. Bush was starting his second term as U.S. president. Hamid Karzai was the new leader of the “liberated” Afghanistan. And the Blazer? Well, the SUV built on the frame of a S-10 pickup was ready to retire. Now, after a 14-year break, Chevrolet has brought back a mid-sized crossover SUV under the name Blazer. But, other than the name, you’d be hard pressed to connect the new SUV with the rough-and-ready truck from yesteryear. Blazer is five-passenger, two-row crossover that fits between the compact Equinox and three-row Traverse. It is attractive – much better looking – than the original, and displays far superior road manners. Its smooth and quiet ride is a credit to unibody construction, instead of the old body-on-frame. It’s also more fuel-efficient, thanks to stop/start technology, cylinder deactivation in the V6 and a smooth-shifting nine-speed automatic that always seems to know the right gear. Its frisky RS trim level is the hot rod of the family. It has the boldest look, with a blacked-out front end and black up-sized 21-inch wheels (from standard 18-inch). It looks especially good on a bright red body colour. Its engine growl is just loud enough to let you know the optional 3.6-litre V6 means business, cranking out a respectable 305 hp and 269 lb.-ft. of torque. The Premier trim level is more dignified, with generous chrome treatment on the outside and quality accented leather interior treatment. Automatic heated steering wheel and heated/ventilated front seats tie in with the automatic climate control system. The windows can be opened remotely to let cabin heat out as you approach the car. All models have HID headlamps mounted low and LED daytime running lights. Cargo space is an impressive 1,818 litres with the rear seated folded. A rail-based system allows the space to be configured and blocked off as needed to secure items, and the rails store neatly in front of the spare tire when not needed. There are some nifty touches to this vehicle – like a hands-free power liftgate with a light that shines a Chevy emblem on the ground to show you where to swing your foot. Inside, the rear seat slides forward to allow more cargo space and tilts back to allow extra headroom – unnecessary, since a six-footer can easily fit with the seat upright. Chevrolet’s updated Infotainment 3 system comes with 8.0-inch touchscreen, and Android Auto and Apple CarPlay compatibility. There are up to six USB ports – even the new USB type-C standard – wireless phone charging, and a subscription-based 4G LTE WiFi hot spot. Active noise cancelling is standard on all trim levels. The rearview camera “hitch view” makes hooking up to a trailer a one-person job. Chevy started with the platform found on the XT5 and Acadia models, but it moved the wheels 44 millimetres further out to gain a squatter, planted feel, said Larry Mihalko, Chevy’s vehicle performance manager. The sporty RS also has high rate suspension springs, heavy stabilizer bars, sport-turned dampers and oversized shock absorbers. Although a relatively tall vehicle, the clever engineers have made this SUV feel very sportscar-like. Its frisky RS trim level is the hot rod of the family. It has the boldest look, with a blacked-out front end and black up-sized 21-inch wheels (from standard 18-inch). The active yaw control system inputs traction data 100 times per second and adjusts power to each wheel. In hard cornering, it sends up to 80 per cent of the power to the outside rear wheel to push the SUV in the right direction. Drivers can also switch to front-wheel drive to cut fuel consumption under highway conditions. Fuel economy ranges around 9 litres/100 km in combined city/highway driving. The stock 2.5-litre turbo-charged four-cylinder offers a marginal gain in fuel economy over the six, and delivers 193 hp and 188 lb.-ft. of torque. A trip to the hills east of San Diego, Calif., confirms that this is an able highway cruiser, but no off-road bruiser. It comes equipped with street tires and a low front end that would whither at the first sight of a rock. Even so, there’s much to like in this revived Blazer. The entry-level basic model starts at just over C$30,000 in Canada, is well-equipped and offers good value. The highest trim levels, however, are more than C$50,000 – definitely pushing the limits of the category, which includes Mazda CX5, Ford Edge, Nissan Murano, and Toyota Highlander. You don’t have to go high-end to get a fun ride with the Blazer. Whatever configuration you choose, it feels like a sturdy and stable vehicle designed for city and highway driving. The Blazer is available for order across North America now.